Finding High Quality Rebrandable PLR is NOT the Easiest Task and That’s Exactly The Reason Why I Decided to Create This Page For The Top PLR Websites. Top Quality PLR Content Can Be The Game Changer in Your Business – On This Page You’ll Discover The Best PLR Sites That Offers The Highest Quality PLR…Guaranteed! You’ve probably already found out how tough it is to find good PLR products….and it can be difficult to separate the good PLR sites from the bad ones. In my years as an online marketer, I’ve found a LOT of high quality PLR–and I’ve also found a lot of garbage. Have you ever downloaded a piece of PLR, only to discover that it’s so badly written that you can’t use it without totally re-writing it? Or, when you DO find a usable product, you find out that it was put out many years ago and it’s already been bought thousands of times over. When I began using PLR in my own marketing efforts, it was easy to see its potential–but l couldn’t get past the poor quality of the products I was downloading. I knew that I wasn’t the only one going through the same thing, and I figured that most marketers wanted to cut through all the clutter and have access to the best PLR products on the Internet. If you want an inexhaustible supply of new, top-quality information products in various niches, you’re in the right place. The founders of All Private Label Content, Alice Seba and Melody Spier, have been giving their customers better quality and more options since 2006. Their topical memberships and PLR bundles make it easy for internet marketers like you to find the perfect PLR for your membership sites and blogs, without a bunch of extras you don’t really need. They believe that customers should get just the content they need to serve their target market, and that site owners should be proud to share the content with their audience. All Private Label Content memberships allow you to get the most for your marketing efforts by offering fresh content every month. With PLR packs from this site, you can naturally increase search engine traffic, keep readers informed, and become an online authority in your field. Site memberships come with access to slideshows, images, articles and reports; you can also sign up for a reseller membership. Every membership on All Private Label Content is backed by a 30-day money-back satisfaction guarantee, so you can try it for yourself without worry. Get started today! Almost 90% of online marketers fail, largely because they don’t understand the importance of building a subscriber list and maintaining relationships with those subscribers. However, even those who know how vital list-building is can get lost in the shuffle. The marketplace is fiercely competitive, and the bigger fish have in-house content creation teams and tons of money to throw around. To set yourself apart from the competition, you’ll need to find a way to get an advantage over the big guys. That edge is: Automated List Profits. With a membership to Automated List Profits, you’ll get access to two reports with squeeze pages that convert site visitors into sales leads. Affiliate and keyword research is included, to make the leap between good content and high profits a short one. The reports come with PLR, so you can rebrand and resell them as you wish. Not only that, you’ll get a series of follow-up emails to accompany each report. Why I Chose To Get a Membership For My Business? Flexible Licensing – I am able to build my list, give them away for free and even use them for affiliate bonuses! Life-time option – I’m not a fan of monthly costs, I have enough of those! A lifetime platinum membership to Automated List Profits is just $97, and there are no monthly fees to pay, ever. There’s a 60-day money back guarantee, meaning that you have nothing to lose—and a lot to gain. Visit Automated List Profits to sign up today. If you’re tired of spending hours writing your own content–or if you’re sick of paying an outsourcer hundreds to create it for you, Big Content Search may be worth a second look. This search engine-like site can be accessed from anywhere you have an Internet connection, and it’s easy to preview articles and download them in ready-to-use or spintax format for submission across multiple sites. Quickly build profitable niche websites. Simply pick a popular niche, put together a blog, and search for, edit and publish your content. Keep customers updated with the freshest content. With so many eBooks in easy reach, it’s simple to put out new info products every week, including sales funnels with upsells, squeeze pages and auto responders. Build hundreds of top-quality backlinks. The search engines provide tremendous traffic for most websites, but you need a LOT of content for good SEO. Big Content Search provides over 125,000 articles ready for spinning and submission to directories. Big Content Search is fully integrated with other IM tools such as submitters, autoblogs and spinners. They’ve really made it simple to find and use high quality PLR articles. With an average price of $2 per article and $7 per eBook, you’re sure to find the best high-quality PLR content. Buy health PLR content packs with no membership required! If you’re building a site in the health niche and you need good content fast–look no further than Buy Health PLR. On the site, you can get physical, mental, financial and environmental health PLR packs, which can help you get your health sites up and running quickly. The author’s healthcare experience means that all content will be accurate and of the highest quality. You’re not forced into a membership; you only buy the content you need. All PLR packs are limited to 250 licenses per pack. There’s a 60 day, 100% money back guarantee if you’re not satisfied. This PLR content is so good that you can put it to use right away. With an average price of $17 per pack, this site is worth looking into if you’re starting a health site on a shoestring budget. The author developed Buy PLR Today with the customer in mind, and she’s open to suggestions for products and articles. Most customers like to buy complete packages for niche websites, so they have all the content they need at the same time. Prices average around $15 per pack, and the content is so good that it requires little editing to make it site-ready. Get yours today before all the licenses are gone! The owner of the PLR and resell rights products store at buyqualityplr.com which specializes in many different niches and adds new PLR and resell rights digital products on a daily basis. Our store is one of the fastest growing PLR sites today. A large variety of coaching content. The founders of Coach Glue, Nicole Dean and Melissa Ingold, have over 20 years’ combined experience in the online marketing world–and they’ve parlayed that experience into a coaching business. This membership site offers a monthly package for $29.95 per month, or you can pay $197 for a year’s worth of business coaching help. Sign up today! The author, Ruth, is from the UK and she’s been creating high quality PLR content since 2008 in a variety of niches such as health and wellness, social media, blogging and WordPress, and self-help. With prices ranging from $3 for a sale PLR pack to $39 for a fitness walking pack, you can surely find what you’re looking for on this pay-as-you-go site. There’s no membership required to buy from Content Shortcuts, so visit today to get started. Ms. Sheldon started Content Sparks with the goal of providing professional-level content that will help you put the spotlight on your expertise, attract leads and build lasting business relationships. If you’re a coach or business consultant, you can visit this site to find the type of content that will help you cover all the topics that small business owners want to know more about. Choose pieces from the site’s huge library, which covers topics in the marketing, business and professional development niches. Customize that content to fit your market segment. Sell or publish the content on your desired platform in your chosen format, and tell everyone about it. It’s really that simple to get started! Content Spark’s bundles range from $24 to $197, but they’re worth every penny. Visit them today to take your coaching business to the next level. Whether you’re a new internet marketer or you’ve been in the game for years and you’re looking for fresh content, DIYplr.com has what you need. They make it easy to grow a mailing list, create new information products, or add great bonuses to site memberships. When you set up your free account on DIYplr.com, you’ll be added to the site’s notification list, and you’ll stay up to date on special discounts, plus you’ll get advance notice of hot new PLR products. The site’s creator, Alice Seba, started DIYplr.com in 2006 in response to a high demand from business owners who wanted valuable, readable and relevant content that they could repackage as they wish. The content you get there will save you a tremendous amount on hiring writers, and it will also save you time on editing and rewriting. Buy from DIYplr.com—your customers will thank you! There are numerous ways to use the monthly packages to grow your business and connect with your audience to sell more products. You can learn how to increase your viewership, outsource your marketing efforts, boost your conversion rates and improve the value of your products. Use these products yourself, sell them to other customers or pass them on to coaching clients. While the company has done most of the work for you, it’s up to you to brand and edit these templates to fit your brand. If you have an online business, you’re undoubtedly looking for an endless supply of fresh, well-written content–but you don’t want to get stuck in a membership where you get a monthly pack of articles you may not even need. Enter Easy PLR; this non-membership site allows you to pay as you go and only buy the article packs you need. Whether you need pieces in the business, health, lifestyle or tech niches, the content you’ll get from Easy PLR goes through two professional writers and editors before it even gets to you–so you can rest assured that it’ll be great. Prices for high quality PLR content range from $5 to $15 per pack, which is a great value for the quality they provide. Check them out today; you won’t regret it! And a lot more. You’ll find content in several categories, such as PLR articles, promo reports, reseller rights PLR, minisite PLR and limited PLR. Regardless of what you need, Flaming Hot has a package that’s just what you’re looking for. The author is so sure you’ll love the content, that he’s offering a free PLR package. While these articles can’t be sold as your own or used along with the author’s name, they make a great base for new articles. If you’re a proficient rewriter, you can quickly turn these into unique content that’s guaranteed to draw more traffic to your site. What are you waiting for! Try Flaming Hot PLR today. It’s easy to get a food blog up and running, but if you want to cut through all the technical jargon and get to the moneymaking part as fast as possible, you can join Lynette and Alice for free training at Food A Plenty. There’s a tremendous amount of PLR content on the site as well, at varying prices; from making bento boxes to finding copycat versions of your favorite restaurant treats, Food A Plenty has it all. If you’re looking to break into the health PLR niche, this site is for you. The Health and Wellness PLR Store has some of the Internet’s best articles on diet, fitness, senior health, juicing, the Paleo diet, acne prevention, ketosis and many more topics. Best of all, every piece of content on this site comes with private label resale rights, which means you can edit it, rename it and make it your own. Turn it into newsletters or sales videos, or use it to populate a niche blog with relevant, readable content that will keep your visitors coming back for more. With this collection of wellness PLR, it’s easy to make money while encouraging your customers to live a healthier lifestyle. On this site, you’ll get the highest quality health and wellness PLR content available. Choose from a selection of ready-made minisites, autoresponders, reports, product reviews, eBooks, and other content for your email lists, website and blog. Use it to build your own health and wellness online business, or package it and sell it to your customers while keeping all the profits. If you’re looking for the right time to get into the health and fitness business, now is the time to start—and this site makes it easy. Melody and her team have been one of the top PLR suppliers for almost ten years. Whether you need articles on DIY kitchen remodeling or pieces on hiring a contractor, you’ll get quality home related content packs that make it simple to find what you need–all without being locked into a monthly membership. Home Improvement PLR believes that customers should get just what they need, when they need it–and each pack has a limited number of licenses, so you won’t have to worry about hundreds of other site owners having the exact same content. Prices start at $15.75, which makes this PLR site a real bargain. Stop by today and fill your site with the freshest content there is! There are tons of PLR sites out there, but HQ PLR Store sets itself apart in a few ways. You’ll get content in an evergreen niche, along with marketing tools, awesome bonuses and sales copy that converts–guaranteed. When you sign up for a membership, you’ll pay just $1 for the first month, and $27 per month after that. ….and a whole lot more. Visit the HQ PLR Store today, before time runs out on this special offer! iBook Wholesaler makes it easy to instantly become an author and start an online info product business. All you’ll need to do is buy a PLR pack, put your name on the products, and list them for sale on the iBookstore. You’ll earn money even while you sleep! Every PLR product sold through iBook Wholesaler includes a professionally-designed website, a sales letter designed to get conversions, top-quality graphics and an eCover package that’s been designed by an in-house design team. The one-time membership fee is typically $47, but if you visit now, you’ll get it for the ultra-low price of $10.37. As I’ve said before, there’s a lot of good PLR content out there, but there’s a lot of poor content as well. At Internet Slayers PLR, they’ve taken the time to separate the good from the bad, so you don’t have to. The content is top-quality. JR, the site owner, only offers carefully written content that’s audience-ready. It’s fluff-free, and every piece contains well-researched and relevant information for a specific niche. There’s no membership to buy. You only buy the articles you need! This isn’t a “content farm”, where article packs have been sold thousands of times. Here, licenses and sales are limited to 180 per pack. JR really cares about the customer, and there’s a 100%, 30-day guarantee on every purchase. Stop by today to see what’s available. Prices for multi-packs and eBooks start at just $10, making this a low-cost way to get the content your business needs. Trish, the owner of Kitchen PLR, started her career as a professional writer in 1995, and since then she’s focused on WordPress design and web content. She’s an avid cook and gardener, and she’s used that experience to create fresh content ready for online entrepreneurs to use. On Kitchen PLR, you’ll find tested recipes, original articles and photographs and detailed product reviews, as well as resources to teach readers how to start their own gardens. Prices on PLR packs start at $10, or you can buy a multi-pack for $24. It’s an incredible value if you run a health or gardening blog, so visit Trish today for the best selection. Geoff and Susan O’Dea, the owners of Master PLR, have been married for many years and they’ve owned online businesses since 2007. They’ve turned their internet marketing experience into one of the web’s top PLR sites. They pride themselves on providing readable, engaging content that will keep your site visitors coming back for more. Either Susan, Geoff, or one of their in-house expert writers writes every article. They don’t sell content that they wouldn’t use on their own sites! They constantly update their library, removing sold-out packs and putting up new, fresh content on a regular basis. 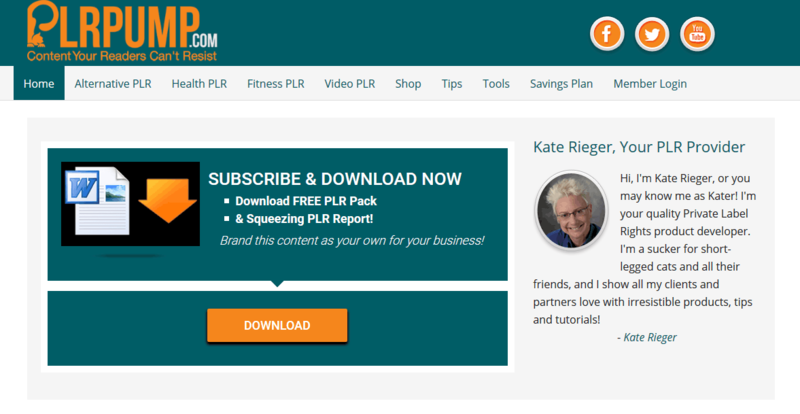 This health-focused PLR site doesn’t require you to buy a membership—you’ll only pay for the PLR packs you need. You’ll find articles on low carb diets, prostate health, fertility and many other subjects. Prices start at about $14 per pack, and you’ll quickly see that this is one of the best places to go for quality health content. If you’re looking for an easy way to populate your natural health blog with great content, look no further than this natural healing PLR store. The industry has seen tremendous growth as more people search for natural treatments for a variety of conditions, and you can be the one to give them that information. As an online marketer in the health niche, you likely do a significant amount of research on trending topics. People want to know more about natural healing products, and if you have this natural health PLR content membership, you can tell them what they want to know. Simply customize the content to your needs, post it to your blog and stay up-to-date with what’s happening in the natural health niche. You’ll get brand-new content every month that you can use as eBooks, email seminars and social media posts, all of which can drive traffic to your website. Natural healing content is applicable to so many niches other than health. Whether you’re in the love and relationship niche and want to tell someone how to cleanse and de-stress after a breakup, or you want to promote products to other business owners, you can make this beauty PLR work for you. With this natural health private label rights content, you can help build your own business and help others at the same time. Creating new informational products can be difficult, even if you’re a good writer—and if you want to hire someone to do the writing for you, it can get expensive fast. At NitroWealth PLR, you’ll get access to a new eBook every month, and you’ll also get a professionally designed sales page and landing page, as well as sales copy that’s designed to convert. Visit them today to get a mini site template that makes it easy to quickly set up niche sites, and a monthly content pack that includes 10 400-word articles. It usually costs $10 to start and $10 per month, but if you visit today, you’ll get your first month for just $1. What a value! And many more we don’t have time to go over here. Chances are, if you’re blogging or writing web content about it, Piggy Makes Bank has a PLR pack for you. And, they have FREE packs so you can try it out before you make a purchase! You can get a free PLR pack on making healthy school lunches, walking for fitness, email marketing, creating products or personal finance. Try one or all, it’s up to you! The authors, Tracy and Susanne, enjoy helping other entrepreneurs take their businesses to another level by finding out who they help and how they can grow their customer base by working with competitors. With Piggy Makes Bank, it’s easy to make PLR your own. Victoria, the owner of PLR boutique, lives in London but wants to travel the world. She started writing web content as a hobby, and she turned it into a business when she found out that people would pay good money for well-written content. At the PLR Boutique, you can get some of the best PLR content for $1 per page. Or, if you need several pieces of content to quickly fill up a niche site, you can get a PLR pack for just $5. Visit Victoria’s PLR site today—you never know what you’ll find. Whether you need PLR on the health, holidays, gardening, internet marketing, pets, parenting or self-help niches, the PLR Content market should be one of your first stops. The site’s author seemingly only goes by her first name, Amanda, but she offers some killer content that can allow you to keep your customers coming back by offering them something valuable. And a lot more. You can try some free PLR to decide whether Amanda’s content is right for your needs, or you can buy some limited PLR that is guaranteed to only be sold to a predetermined number of people. While this content is sold at a slightly higher cost, it is still very cost-effective when compared to the expense of hiring a ghostwriter. With this content, you can’t possibly go wrong—so grab some of this limited PLR before it’s all gone! The owner of PLR Health Wizard, Gail Trahd, was a registered nurse for over 20 years. With all of that experience, she began a second career as an internet marketer with a focus on health and wellness. However, she soon discovered that the quality of most health and fitness PLR was sorely lacking—so she decided to create her own. At PLR Health Wizard, you can get access to thoroughly researched, well written and updated content for your fitness and health blogs, minisites and social media pages. At this PLR membership site, you’ll get access to great content, sales materials and coaching for the bargain price of $27 per month. Visit soon, before this great deal ends! Ronnie Nijmeh, owner of PLR Me, took a simple blog and turned it into a source for traffic, offline PR and sales leads. He’s taken that experience and used it to start a membership site to help others in the IM field. His team creates unique, fresh content every month. Members get access to the content and they can sell it, put it on their own sites, give it as a sales bonus, or use it any way they see fit. This done for you PLR content isn’t like any other that’s available. There are many other providers out there, but none offer what Ronnie and PLR.Me do–a proven traffic building system with guaranteed results. Ronnie’s Self Help PLR content is the best solution for high quality coaching content suitable for health and wellness professionals. Visit today to pay your introductory fee of $19, and pay just $97/month after that. Tiffany Lambert, the owner of PLR Mini Mart, made it her mission to help other online marketers make higher profits with quality content. On this site, you don’t have to pay for a membership; you’ll find a wide selection of high quality PLR. You can buy it by the piece for $5, or in a multi PLR pack for roughly $57, and you can get access to short reports, affiliate reviews, eBooks and blog posts. The choices are numerous and the prices are low–so visit the PLR Mini Mart today to see what Tiffany has in store! However, these three things can be difficult to obtain. It’s difficult, expensive and time-consuming to create your own products or to design your own sales page, especially if you have no graphic design experience. It’s so hard, in fact, that many fledgling marketers give up altogether. It’s all up to you, and the choice is yours. With PLR monthly, you’re always guaranteed access to the best, most current and relevant content. Visit the site today to get started, and watch your online business grow by leaps and bounds. Gail Trahd also owns PLR Relationship Wizard, and she has built a career on listening to what other marketers want. If you love what you do, but find it hard to come up with enough fresh, well-crafted dating and relationship PLR content for all of your websites and niche blogs, count on Gail to help. This high quality relationship PLR content PLR license is very flexible, the only things you cannot do it resell the PLR or resell rights. At PLR Relationship Wizard, you can buy articles on subjects such as dating, marriage, breakups, divorce, separation and saving a marriage. With a $14.99 membership fee, you’ll get access to PLR content of consistently high quality at a low cost. Being a ghostwriter can be lucrative, but the major problem is that once it is sold, it doesn’t earn you any more income. While referral work is sometimes available, it can be sparse. However, there’s another content market, called PLR, that can change your online marketing and writing efforts. PLR content, or private label rights, is sold to multiple buyers. However, you can change the content as you see fit. PLR licenses differ, but the most flexible ones allow you to brand the content as your own and even put your name on it as the author. With PLR Pump, you’ll be able to streamline your product development process, especially if you lack the time, skills or money to invest in a professional ghostwriter’s services. PLR Pump offers some free articles for publishing on your own health or fitness site. That way, you can try out the content to see if it will be a good fit. If you’re building a health and fitness website, you can certainly find the right content at PLR Pump. The author, Kate Rieger, has significant experience in the niche and she prides herself on providing content that answers customers’ concerns. Offer your customers something valuable and increase your sales today! If you’re looking for great content that drives conversions and turns visitors into customers, but you don’t have the time, money or inclination to write it yourself, PLR Productions is a must-see. Bonnie Gean, the creator, has put together a library of relevant, readable and engaging articles, information products and other materials. Use them to populate your blog, package and resell them, or use them to make your bottom line grow. Reports and articles from PLR Productions are available on a wide selection of topics for various niches. Most of its article packs include memes, Tweets, social media posts, PowerPoint slide sets, and top-seller lists for Amazon. All of these make great tools in your IM toolbox! Inside PLR Productions’ image packs, you will find numerous Facebook timeline cover photos, infographics, mascots and social media quotes. Use these as selling tools that can build brand awareness and change casual site browsers into customers. Reseller PLR from this site will make it easier for you to devise a content-driven marketing strategy. If you want to start your own PLR store—but don’t know how to get started—you can buy one of PLR Productions’ packs to start off on the right foot. Whether you are running your own PLR membership site or you need fresh content for your site, you can find what you’re looking for here. With private label rights packs from PLR productions, you can increase profits without investing too much of your valuable time. A high-quality training eBook each month. These 10,000+ word guides are informative and current, and they are full of useful info on the topic of each month’s product. With these complete sales funnels with PLR, you will also get a full set of professional-quality graphics including DVD covers, sales page art and a lot more. These graphics will make your product look more credible, and they come in PSD format for easy editing. Simply add your own images and text, and you’re ready to go. These videos include the most up-to-date information available on each month’s PLR topic. With the production values of these videos, your customers will be able to tell immediately that they’re getting the best value for their money. In the videos, your customers will get step-by-step guidance on how to use each month’s product. In addition, you’ll get an audio series that your customers can load onto their favorite device for on-the-go use. All of these features are private label, so you can rename files as you choose. With the PLR Sales Funnels PLR Business In A Box Membership, you’ll also get sales copy for upsells, follow-up emails, a professionally designed squeeze page and much more. Join today and save almost 65% on each PLR product, every month. With this biz in a box, the hard work is done for you—simply set it up once and watch the money come in on autopilot. This monthly PLR membership site gives you access to high quality PLR Packages and it makes it easy to flood your sites with new content each and every month. ….All without creating a single product yourself. With a membership to PLRXtreme, you’re still going to have to work to be successful, but your job will be much easier because their PLR packages are all done for you, ready to upload and start profiting right away. They are all completely rebrandable with editable graphics so that you can make sure your new PLR stands out from the crowd. What to expect from their Complete Turnkey PLR Packages? Most internet marketers are aware of the huge moneymaking potential of WordPress, but they don’t know how to cash in. If you have programming skills, you might not have time to make your own plugins, or you’re not sure which kinds people are looking for. However, you’ll run into bigger issues if you have no coding experience. You’ll have to hire someone to make plugins; a basic one can cost more than $200, and if you find a developer who’s willing to work for less than that, the plugins you get may be riddled with insecurities that leave customers’ websites vulnerable. The Plugin Mill develops PLR Plugins that is the most worry-free, affordable way to get resellable WordPress PLR plugins every month, without the hassle and expense of in-house development. You can use these plugins to start a WordPress business, or to further market your existing products. Comes with a PLR license so you can rebrand and resell it as your own plugins! Not only that, you get the peace of mind that comes when you don’t have to do the market research or wait for customer support. This PLR plugins Membership is only $97 per month, and there’s a full, 30-day money back guarantee. Brought to you by the same team who created Best Quality PLR, Tools for Motivation strives to provide the best quality PLR in the personal development niche. With a monthly PLR membership fee of $97 per month, you’ll get valuable tools such as new self-help PLR products as soon as they come out, amazing discounts, and online business training. With all of that and access to a top-notch support system, the only thing we want to know is…why haven’t you visited Tools for Motivation PLR yet? If you’re on this site, you understand the value of quality WordPress PLR videos–and it’s quite easy to see why: smart marketers like you are building profitable WordPress training businesses with it, every day. The site creator’s mission is to offer the best WordPress PLR package you’ll ever buy. You’ll get all this for a one-time payment of $197, or you can make three easy payments of $77 each. The choice is yours–visit Tutorial Mixer today. Contact me if you want a coupon for this, Stephen organized me a special 50% discount coupon for people that purchase through my link. When you buy Tribe Bloom PLR, you get market-specific content that you may use in your marketing efforts—all without any effort on your part. You can put your own branding, name and logo on the content to make it fit your business, or you can package it as a giveaway or email lessons. When you buy Tribe Bloom’s health and fitness PLR you can spend more time on your lifestyle company (or on vacation) rather than spending time creating your own content. A well-written eBook can take months to create, particularly if you’re inexperienced, and that doesn’t even count editing and research time. With Tribe Bloom’s health PLR videos and other content, you can get the stuff your customers want, without the huge commitment on your part. Tribe Bloom only uses the best writers in the health and fitness business, because selling poor-quality content won’t help you or your customers. Writers are experts in their niches, and they put a great deal of effort and time into writing and researching the content you buy. Therefore, you get eBooks, email swipes and other content that’s expertly written, accurate and informative. While other marketers pay up to $40 per page of top-notch content, you can get the same quality from Tribe Bloom for $1 per page or even less. With Tribe Bloom’s personal development PLR you can modify and edit things as you see fit, and you must list yourself or your brand as the author. Use it as web content, emails, newsletters, e-courses or whitepapers, and give it away for informative use. Use it as you see fit, and watch the profits roll in. You can expect most of the content to focus on the personal development and online marketing niches. It is heavily centered on helping female entrepreneurs build a successful business or achieve a personal best. And, best of all…. All the content comes with PLR (private label rights)! You can add to, take away from, edit and modify the content as you see fit, and you can even list your name as the author. Publish it on your business’ social media profile, add your branding, or use it as an opt-in gift or a bonus for paid subscribers. For the social-friendly images, you can repackage them and sell them with ‘edit for personal usage’ rights. However, you can’t offer reselling or white-label rights. Despite these limitations, the White Label Perks membership offers an unbeatable value. This is one of the best and latest WordPress PLR packages that is completely done for you and ready to go. Just download this WordPress business-in-a-box, add payment links, upload to your server and profit. With the WordPress Income Formula PLR Video set, you’ll be able to build WP blogs and market your service to business owners. These video training courses provide the latest techniques and strategies to help you maximize WordPress for your own profit. Ready-made sales materials such as sales pages, copy, graphics, etc. Cool bonuses such as ready-to-use affiliate pages are there as well, along with affiliate banners and swipes. If you were to build your own collection like this one, it would cost you thousands of dollars and many hours of research—but they’ve simplified things by putting it all together and selling it for a rock-bottom price. The course comes with a thirty-day money back guarantee, and it also comes with full PLR rights. You can rebrand and even re-record these courses and sell them as your own, keeping all the profits. Running a website can be exciting, but it can also be difficult if you don’t keep your sites populated with updated, interesting and readable content. With this PLR sites list, you can find the right articles for your blogs, and you can find PDF reports that will entice customers to leave their contact information. The above list of PLR sites is without a doubt the best source for high quality content that is completely rebrandable with private label rights and can be used as your own to help training your customers and know that you’re selling them training you can be proud of. With well-written content, you’ll find it easier to get to the top of the heap–and easier to stay there. As you must already know, I look after my customers that support me. So if you purchase any products from any of the above PLR websites, forward your purchase receipt to me and I’ll match your entire purchase price with any products from my PLR store at buyqualityplr.com. You can browse to see your potential bonuses you can choose from here, we’re constantly adding products so you’ll have a wide variety of PLR and resell rights products to choose from. I make money on some products and services that I talk about on this page through affiliate relationships with the merchants in question. I get a small commission on sales of those products.